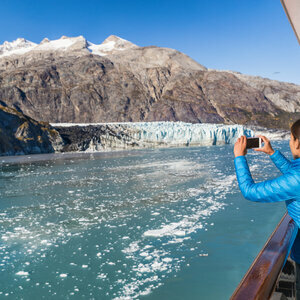 Secure your spot on our Alaska Cruise Tour for only $700 per person! Fly from your home cities to Vancouver. Your transfer to the cruise ship is included. This is one of the most famously beautiful passages in the entire world. Get ready for amazing views and wildlife like nowhere else as you sail through the islands of Alaska's Inside Passage. 7:00 am - 4:00 pm. Its Tlingit Indian name, Kach Khanna, means "spread wings of the eagle." Chances are you'll see one of these magnificent birds perched atop a Sitka tree. Thanks to its abundant rainfall, Ketchikan is surrounded by some of the world's most lush wilderness. Northbound Cruise - 11:00 am to 9:00 pm. Juneau has been called “Alaska's peak experience,” certainly due in part to its unparalleled glacier viewing from such places as Tracy Arm Fjord, the Juneau Icefields and Glacier Bay National Park. Northbound Cruise - 8:00 am to 8:00 pm. In a single year from 1896 to 1897, this remote town along the Inside Passage grew from a few tents to a city of 20,000 gold seekers. Today, travellers come in search of other riches - to experience yesteryear along Skagway's charming boardwalk lined with buildings that replicate those Gold Rush days. Get up close and personal with the gigantic Hubbard Glacier, North America's largest tidewater glacier. It's 1350 square miles of blue ice and one of the most active in Alaska. Depart the cruise ship in Seward and make our way to Anchorage for the night. We will have a city tour today and then more time to explore on your own. After a special stop to visit the North Pole and “Santa Claus House”, our day will finish in Fairbanks for a two-night stay. Dawson City is a true Gold Rush town still boasting gravel roads and wooden sidewalks and history galore. Tonight, you will visit Diamond Tooth Gerties. You will experience the Gold Rush yourself with a chance to pan for gold. We will have a local guide for an amazing historic tour of Dawson City area to help us see the way it was here 100 years ago. A visit to the “Midnight Dome” is planned for tonight. Our day finishes with a stop at the Sign Post Forest. You are welcome to bring along your own sign, your tour director will have everything you need to put it up! As we continue to head homeward, today we will stop for a picnic lunch. We will make a stop at the Fort Nelson Museum. As we leave Fort Nelson we start to leave the Northern adventure behind. Today we return home to Saskatchewan. The prairie landscape is always inviting. Secure your spot on our Alaska Northbound Cruise Tour for only $700 per person!